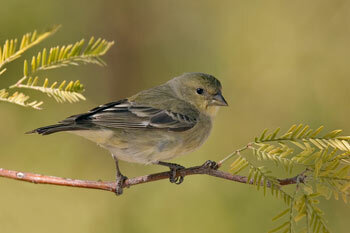 The Lesser Goldfinch is a very small american song bird. They are between 10 and 11 cms (4 - 4.5 inches) in length, they have a wingspan up to 20 cms (8 inches) and they weigh approximately 9.5 g (0.3 oz). Males have a yellow coloured underside and olive green coloured upper parts with a yellow rump. Their wings are dark with white wing bars and they have a black capped head. Females are more dull than males and they lack a black capped head. Juveniles are similar in appearance to adult females but they are slightly more buff in colour. There are differences in appearance between the different subspecies and these are outlined in the subspecies section below. They have dark coloured, cone-shaped beaks and small dark brown eyes. Their vocalizations consist of a rapid melody of twittering notes and they are known for mimicking short parts of other birds' songs. Their flight pattern is swift and bouncy with rapid wing beats. 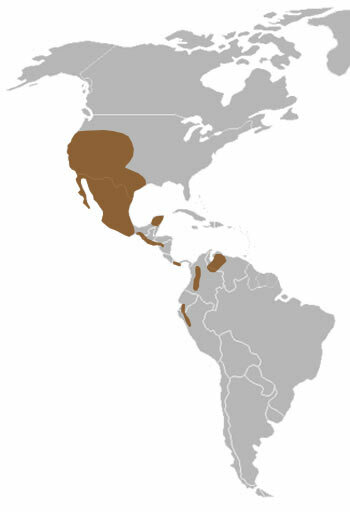 Lesser Goldfinches are found in the grasslands, woodlands and gardens of west and south west USA and northern South America. 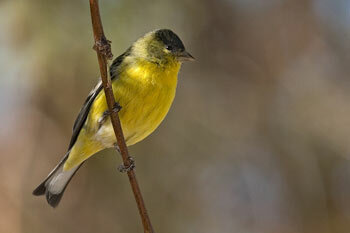 They are usually found in flocks and it is common for them to be seen at garden feeders. Throughout most of their range they are permanent residents but in some colder areas they migrate southwards during winter. Lesser Goldfinches mainly feed upon a variety of seeds. During the breeding season a cup shaped nest is constructed in a bush or low tree from twigs and other plant matter. Females lay 3 - 5 pale blue/white eggs and she incubates them for 12 - 13 days. During this time and for the first few days after the chicks hatch, the male brings food to the nest, but after this period both parents feed the chicks. When the young are 2 weeks old they are ready to leave the nest but their parents continue to feed them for at least another week. Predators of the Lesser Goldfinch include birds of prey such as the american kestrel and the sharp-shinned hawk. They are found in the western areas of the Lesser Goldfinch's range and males have a green coloured back and a black cap on their head. 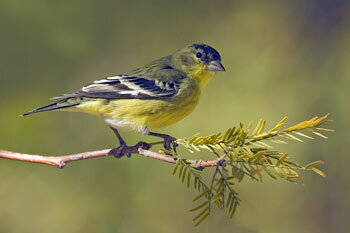 They are found in the eastern areas of the Lesser Goldfinch's range and males have black coloured backs and napes.